A few months back an interesting and to my mind potentially important debate on the question of pluralism in schools opened up in these pages. Many of us weighed in debating the pros and cons of pluralistic Jewish education, trying to define what that phrase meant and to examine whether or not it was “good for the Jews”. In my opinion good points were scored by both “sides” and that was what made the debate worthwhile and enriching. I personally found Michael Gillis’s critique of a “pluralist position” from a traditional view, [Mifgashim no 7, Dec. 30 2001], particularly interesting and thought provoking. In this critique, Michael challenged the validity of pluralism within an orthodox context and claimed clearly that this was not the relevant discussion for orthodox frameworks. I want to return to the question now, after a recent experience that I had traveling to an area of the Jewish world where a high percentage of Jewish kids of school age go to a wide assortment of Jewish schools. It was my privilege to go into five big day schools and to see something of the school culture, meeting with Jewish studies staff and students alike. I come from the world of informal education and am not by nature a “day school person”. I have had little experience of day schools in my decades in Jewish education. But they left a deep impression on me, and the fact that I had the opportunity to see a number of schools in a short time inevitably led me to compare and contrast the things that I saw, although that was not the object of my visits. I want to pass on some of my impressions because there were some things that worried me deeply both as I saw them at the time and even more in retrospect. The relevance to the issue of orthodoxy (or indeed any non-pluralistic ideological line) and educational pluralism, will be made clear. Let me state straight off that I am well aware of the dangers of generalising from one day visits to different schools. I absolutely accept the fact that one’s ability to define a school in definitive terms on the basis of a five to eight hour visit is severely limited. However, after seeing the schools and talking with some of the staff in both structured and unstructured settings, I feel confident in the things that I am going to say and if they sound arrogant, I apologise. If I am wrong, I apologise twice. But I have to say that my impressions were very strong and I would be very surprised if I was too far off the mark in my observations. So for what they are worth, here they are. Three of the schools impressed me deeply. One was formally orthodox in a very liberal kind of way and the other two were basically community schools, not formally committed to a specific kind of Judaism (although until recently one of these was defined as progressive). What really impressed me in these schools was the openness of the staff to new ideas, their willingness to grapple with difficult questions and their acceptance that they did not necessarily have all the answers but they knew what the questions were that needed to be addressed. In the two of these schools where I had a good chance to walk around and observe, it seemed to me that there was a good and open level of communication between staff and students. There was flexibility and friendliness, characterised by a good level of bantering and the ability of the students to approach the staff on a number of different levels. That was encouraging and I came away from all three encounters with the feeling that despite the differences in the schools, I could happily put my own kids into any of them (which is I guess, the ultimate litmus test for any educator). It was the other two schools that concerned me. Both of these were modern orthodox institutions. They bothered me on different levels. The first level is ideological. Let me state that I have no philosophical problem with a modern orthodox school for modern orthodox kids, whatever that means. But this clearly was not the case here. In one of the schools in particular it became clear to me in a short time that the official ideological line of the school might be one thing but the majority of the students come from a very different place indeed. My impression here was of a school bearing down very heavily to push an ideological line that was ultimately alienating to perhaps the majority of the students in the school. Judaism came out as something repressive and to a large extent alienating for many of the students. I felt depressed by my feeling that the majority of students would learn whatever they would learn inside the school but would see Judaism in its halachic variety as something from which they would need to escape when they left the school. This, to my mind, was Judaism as repression. I am sure that there are good and talented teachers there who have the ability to engage the students and to challenge them in a way that “pulls them in”. But I also believe that if students were to be pulled from a marginalised position regarding halacha to a position of deeper involvement and obligation, that would be despite, and not because of, the school. I now understood for the first time, why, over the years, I have encountered so many students, graduates of day schools, who seemed so uncommitted to and indeed alienated from their identity as Jews. This seemed to be a Judaism that was concerned with answers rather than with questions. This might come out of a deep commitment to the tradition and to the sense of commandment and obligation that Michael Gillis so eloquently talked about. However, I am convinced that from the point of view of that large section of the student body that did not buy into the system, the results of their Jewish education were likely to be more negative than positive. This is tragic and it must be addressed. Schools like this, (if I am right in my analysis of this school), do more harm than good to large parts of the Jewish student body and thus to the future of Judaism. I repeat: my argument is not with the concept of the modern orthodox day school so much as with the negative things that are sometimes done in the name of that ideological system. A line is put over to students who cannot honestly buy it. They inhabit an educational world that is so convinced of its own rightness that they are not encouraged to question. If they are, it is often merely a tactical move before they are hit over the head with the only right answer – right for the school and wrong for them. By refusing to confront the reality of the real position of many of the students, the school is incapable of engaging them in the language of their real concerns. Let me say that I have now moved beyond the specific school situations that (I think) I saw and am exploring the outer boundaries of the problem of ideological education. The other school brought up another problem. The first school had had a staff clearly committed to deep education. The question there, as I have suggested, was whether its devotion to its perceived cause was productive or counter-productive. Here, in the second school, it seemed to me that I was confronting a staff many of whom had no questions and no real interest in the depth of the issues that “making Jews” should provoke. There seemed to be little if any fire: minimal inspiration. 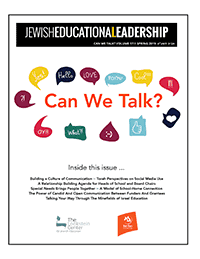 I sensed little interest among the staff in grappling with the issues of Jewish education. They had their subjects to put over and after many years of teaching, they were tired and unenthusiastic. Lip service rather than real dedication was clearly the name of the game that many of these teachers were playing. And I kept thinking to myself: how could most of these people inspire anyone to confront the real issues of being Jewish? There was a feeling of going through the motions of education. What I felt they were doing was teaching (subjects and knowledge) rather than educating and engaging. My feeling was (and in this I might be totally wrong – it is little more than a hunch) that this was the price for teachers who have been teaching for too long in a school setting where they have not really engaged the students. As a result the enthusiasm that comes from the perception that you as a teacher have really affected people’s lives, was totally missing. My feeling was that many of the teachers and students were orbiting quietly in their own solar systems without having very much contact with each other where it really matters. It is in this respect that I link the apathy of the teaching body to the question raised earlier. Ideological schools which by their nature are missing a large part of the student body for the reasons mentioned before, are likely to be a recipe for exhausted and unexcited teachers. If teachers have no curiosity and enthusiasm, how can a school expect them to have any effect in creating Jews other than by putting in the knowledge which can be measured in exams and tests? Here, once again, I felt that teaching of things Jewish might be going on but real Jewish education in the deep, engaging, sense, seemed to be sorely missing. Incidentally, I was not overly impressed by what I saw of student-staff relations in the two schools mentioned previously. Some individual teachers clearly had good personal relations with students, but it seemed to me that once again it was almost despite the culture that the school engendered. Once again, I might be “barking up the wrong tree” in these particular cases, but it is certainly possible to suggest that a repressive ideological teaching situation sets up the potential for teachers and students to see themselves on different sides. In this situation it is easy to see how they might view each other as confrontational adversaries: from this to a poor student-staff relations there is a clear line. Individual teachers might well transcend the potential difficulties, but the school as a school, will find it difficult to avoid tension in this regard. So that’s it. That’s all I can offer: some maybe-mistaken-impressions about schools in which the teachers “miss” (i.e. fail to leave a real positive mark on) the students in Jewish terms and where the students equally “miss” the teachers. And these schools were large, producing over a course of years, thousands of graduates. It is clear to me that this is not the whole of the day school movement. As I said previously, three schools impressed me deeply. But I was worried by these two, and the fact that they were both modern orthodox is clearly not coincidental. I came out of this experience more convinced that ever of the virtues of the pluralistic approach for the majority of the diaspora Jewish world. Going back to the previous debate of a few months back, it should be stressed that pluralistic education in this context does not mean non-ideological or non-value based. It means creating a framework in which students can explore openly and safely the questions that really confront them and find their own ideological position. Michael’s theoretical defence of the non-pluralistic line notwithstanding, I saw a picture in practice from which I absolutely shrink. The particular schools that I visited are not important to the analysis. Even if I am totally wrong in what I think I saw (and I would be most happy to think that I am! ), the question still exists. Is this picture true for any/many ideological schools around the world? How does one avoid the pitfalls of alienation of students and staff, both ideologically and personally, in ideological schools? I’m not looking for orthodox or other ideological non-pluralistic schools to come forward and defend their own record. I would like to propose that the debate (if it develops) must be an honest one in which schools are prepared to critique themselves strongly and openly, (is that naive?). Obviously, too, it should never get personal. The issue is too important. On the assumption that the entire Jewish educational community should be concerned with these questions, they need to be debated rationally and out of genuine concern for the situation and for all who are involved in the issue. Responses?